Peter has worked at MG Corporation in various roles for over 4 years and is currently the Administration Liaison Officer. Peter provides administrative support to MG Corporation and is also responsible for various aspects of community development. In addition to his role with MG Corporation and in recognition of his strong leadership skills, Peter currently holds a number of directorships. 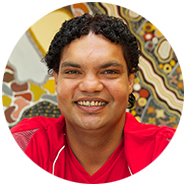 Peter is the Chair of Kununurra Waringarri Aboriginal Corporation. Prior to holding the role of Chair, Peter was a director of Kununurra Waringarri Aboriginal Corporation for 4 years. Peter is also heavily involved with the Empowered Communities reform initiative and is currently the Chair of Binarri-binyja yarrawoo Aboriginal Corporation (Backbone for Empowered Communities in the East Kimberley). Peter was also recently appointed as a director of Ord Valley Aboriginal Health Service (OVAHS). Peter’s extensive corporate governance experience has provided him with the opportunity to further develop his governance skills and strengthen his relationships with key stakeholders across the region.